Pedestrians and bicyclists traveling along Wooley Avenue this summer will be safer following action taken by the McCall City Council at its regular meeting last Thursday. The council awarded a contract worth about $360,000 to Falvey’s Earthworks of McCall to build a separated pathway along Wooley Avenue from Denali Court to Spring Mountain Boulevard. “The section we will be constructing this spring is one of the more dangerous road sections to share the road,” McCall Parks and Recreation Director Kurt Wolf said.. The work will build a boardwalk about 1,100 feet long and 10 feet wide over wetlands on the southern side of Wooley Avenue. It is expected to be complete by June 30, Wolf said. The east end will connect to the Spring Mountain Pathway, which was built last summer, on the east side of Spring Mountain Boulevard. The west end will connect back to Wooley Avenue at Denali Court. Several measures to preserve the wetlands will be required as part of a permit the city had to obtain from the U.S. Army Corps of Engineers, Wolf said. The boardwalk will be elevated 30 inches off the ground and two “bump-outs” for educational exhibits on wetlands will be included. The city will also add planted areas to promote pollination and plant diversity to help reduce disturbances to the wetlands. About $315,000 for the work will be funded from the city’s capital improvement fund. The remaining $45,000 will be funded by the Spring Mountain Ranch Homeowners Association, which also funded $5,000 for preliminary engineering. Wooley Avenue from Denali Court to Davis Avenue will continue to function as a shared road between motorists, pedestrians and bicyclists until that section of pathway is built. That section will likely be built in conjunction with repairs to Wooley Avenue, but that portion of the work has not been scheduled, Wolf said. 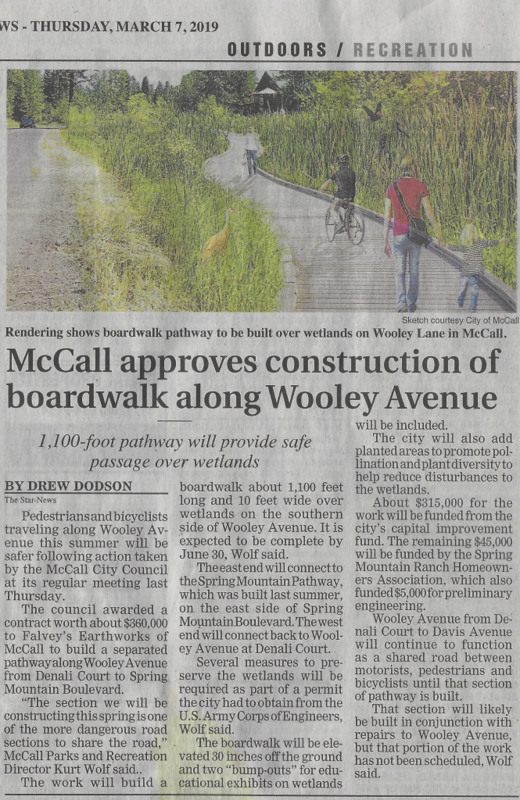 Valley County Pathways appreciates the support of the McCall City Council in approving this much-needed project. Congrats to McCall Parks and Recreation Director Kurt Wolf, a VCP board member, for his leadership on this project. Help us connect our communities with pathways that wind through our favorite places. Help us provide a conduit for our residents and visitors to enjoy an outdoor outing for fitness and recreation, or perhaps a pleasant commute to work, shop or dine out. Help us enjoy our pathways together as one community. You can help us realize that goal by giving to Valley County Pathways as part of Idaho Gives. We are a bonafide nonprofit organization, and we’d appreciate your support! We are suggesting contributions of $10, $25 and $100 for Idaho Gives. The money will go toward our $800/year liability insurance policy, trail planning studies, new trail construction, trailhead kiosks, maps, signage and more. We are working together with the West Central Mountains Economic Development Council, Mountain Central Association of Realtors and the International Mountain Biking Association (IMBA) on a singletrack feasibility study this spring/summer on our key pathway corridors between McCall and Cascade. If some of the routes are feasible, we want to move swiftly into trail development! Widening bike lanes on Warren Wagon Road as part of Federal Highways Administration plans to repave a 5.5-mile section of the road in 2018 and 2019. McCall area citizens rallied to public meetings and made their voices heard on the bike lane issue. 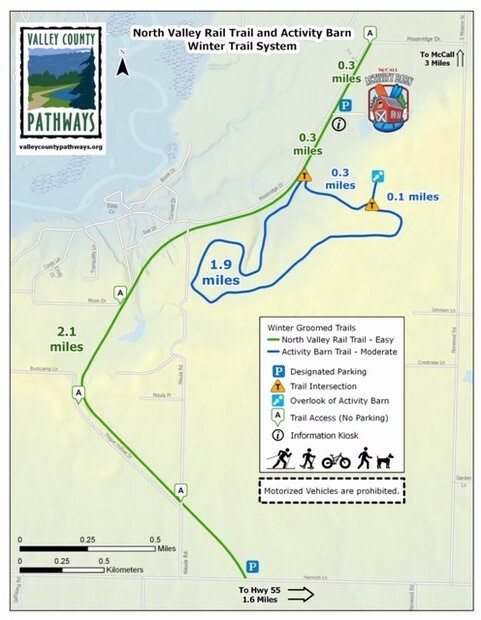 Extension of the Crown Point Trail by ¼ mile in each direction through a donation of real property from the Putman Family to Valley County Pathways. Creation of the North Valley Trail from River Ranch to Heinrich Lane via property donations and easements. The trail has been operational since 2007 and new pieces and improvements have been added since that time. Creation of the Strand in Cascade, a 2-mile trail that runs along the North Fork of the Payette River from the south bridge to the Water’s Edge RV park. Creation of the Boulder Creek Trail in Donnelly through the donation of property by Hugh and Georgia Ann Fulton and a substantial grant from the Boise National Forest Resource Advisory Council (RAC). The trail opened in 2012. 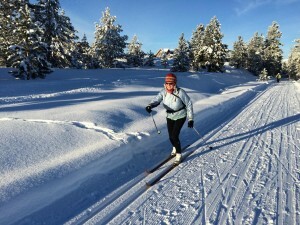 Linking up groomed cross-country ski trails from the Activity Barn to the North Valley Trail for xc skiing, snowshoeing and fat biking, working with Brundage Mountain Resort. Creating a new pathways master plan that was approved in 2017 by Valley County Planning & Zoning and the Valley County Commisisoners. The plan includes a master plan map, outlining existing and proposed pathway corridors along with xc ski trails, water trails and key public trailheads in Valley County and Adams County. Improved highway signage pointing out pathway trailheads to motorists and tourists visiting the valley. 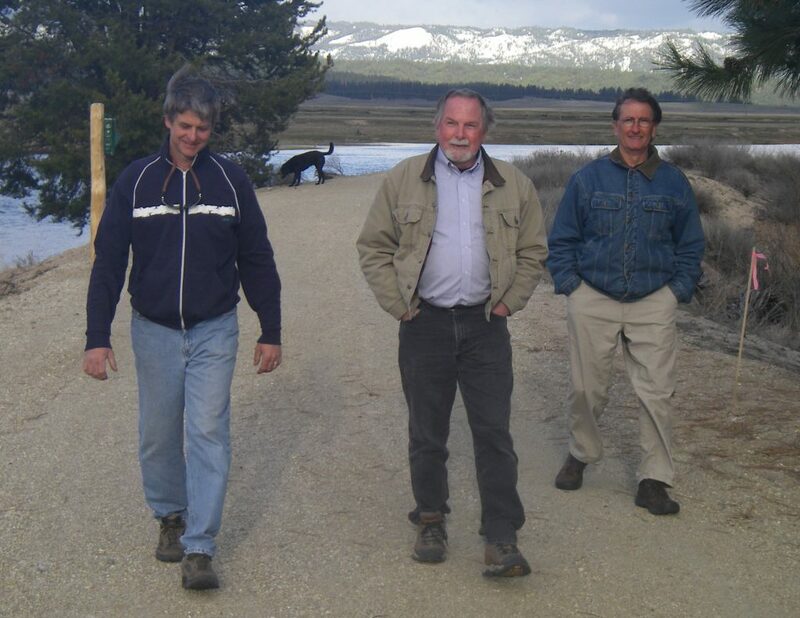 • Substantial update of the McCall Area Pathways Master Plan in 2012. • Creation of the Donnelly Pathways Master Plan in 2014 with an emphasis on creating pathway corridors that tie together between Donnelly and Lake Cascade. • Creation of the Cascade Bike and Pedestrian Plan in 2015.• Development of a new, detached pedestrian pathway from the City of McCall to Bear Basin Road (summer use only at this time). Let’s work together to develop a world-class pathway system in Valley County! Please tell your friends! 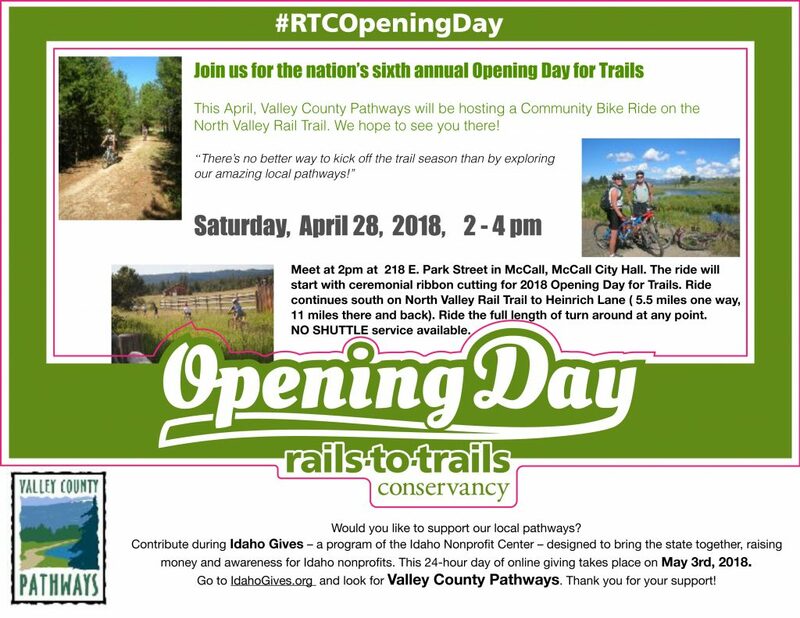 There will be a group bike ride starting at 2 p.m. next to McCall City Hall on McCall Pathways heading out to the North Valley Rail-Trail. It’s a 10-mile ride out and back. Walkers and trail-runners are welcome to join. Refreshments will be served afterwards. The Opening Day of Trails event coincides with the National Rails to Trails Opening Day of Trails event for hundreds of rail-trails across America. VCP officials will be clearing the North Valley Rail-Trail of snow prior to the event to ensure there is a way through shady areas on the way out to Heinrich Lane. New IMBA feasibility study on singletrack trails is super-exciting! This story ran in the Idaho Business Review recently. Reprinted with permission. 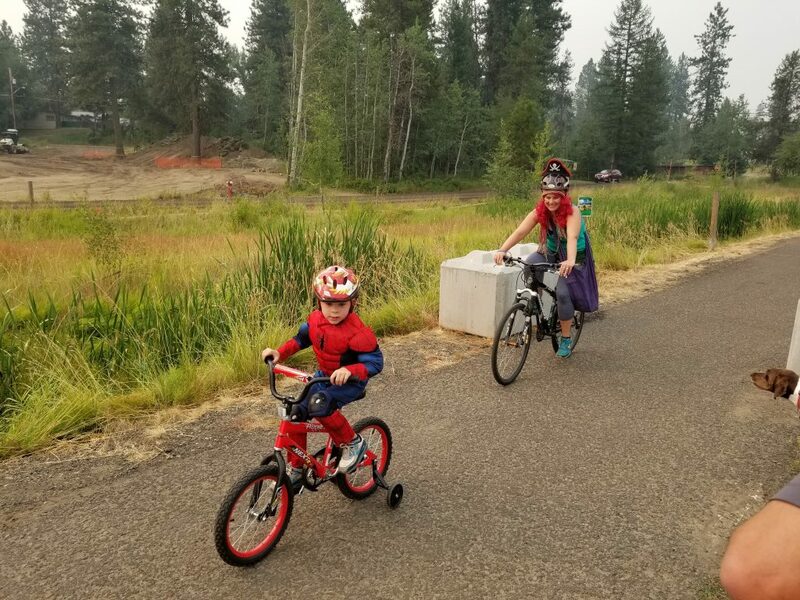 A bicycle trail connecting the Valley County towns of McCall, Donnelly, and Cascade is one step closer thanks to a grant to help determine its feasibility. The study is slated for spring, and the trail could be completed by as early as next summer. Valley County Pathways has been working to develop bike trails in the area over decommissioned rail lines, but was stymied because private property owners have been using that land and didn’t provide recreation access, said board vice president Steve Stuebner. “We realized we would need to look at other corridors as our highest priority,” he said. Instead, the organization started considering a narrow singletrack pathway for biking along the right-of-way of existing county roads. This is where the feasibility study comes in, because the area gets a lot of water with snowmelt and there are drainage ditches along the roads. Also, the extent of the county right-of-way isn’t clear, Stuebner said. So with a $15,000 grant from the National Association of Realtors, awarded in October, as well as some matching funds, Valley County Pathways is working with the International Mountain Biking Association, or IMBA, to determine whether the project is workable. Although the IMBA is doing the work, the proposed trail won’t be limited to mountain bikers, Stuebner said. “Our whole vision for that Valley County pedestrian pathways is this should be open to anybody, at any level – walkers, runners, bicyclists, potentially horseback riding,” he said. 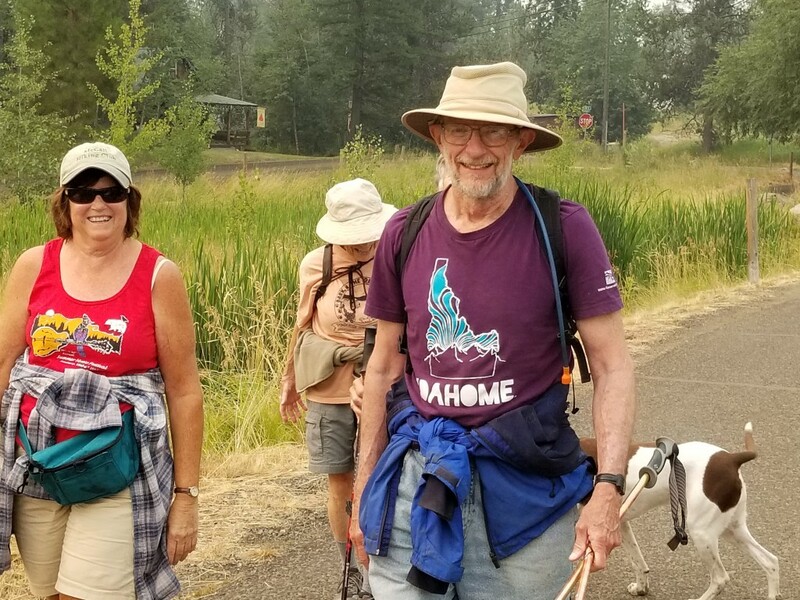 A similar system, the North Valley Rail Trail near McCall, has been developed for winter use such as snowshoeing and cross-country skiing as well, he said. The city of Cascade, Kelly’s Whitewater Park and Valley County Pathways are working on a 12-foot pathway that extends for 2.25 miles along the Payette River between Water’s Edge RV Park and Fisher Pond Park, according to the Valley County Pathways website. A singletrack trail accommodates one bike; a doubletrack trail has two parallel tracks and can be used by four-wheeled vehicles. “It’s a dirt, meandering single track,” said Andrew Mentzer, executive director of the West Central Mountains Economic Development Council, a nonprofit regional economic planning body for the west central mountains, including Valley County and Meadows Valley in Adams County. Mentzer’s group suggested the idea for the trail. Typically, such tracks are functional for about five months of the year, from June through October, outside of winter and “mud season,” he said. While there are some singletrack trails in the Boise foothills, in Sun Valley, and in the mountains around Tamarack, “to do it on the valley floor is really a brand-new concept,” said Stuebner. Singletrack is considerably cheaper than other alternatives, and a track built specifically for mountain biking is more exciting. “Folks like IMBA can build in some cool trail flow features to make the riding experience more interesting for people – bank corners, little jumps,” he said. The singletrack system is a great benefit to the community, especially to people who want to commute between the towns via bicycle, said Corbet, who said she is a bike rider herself. 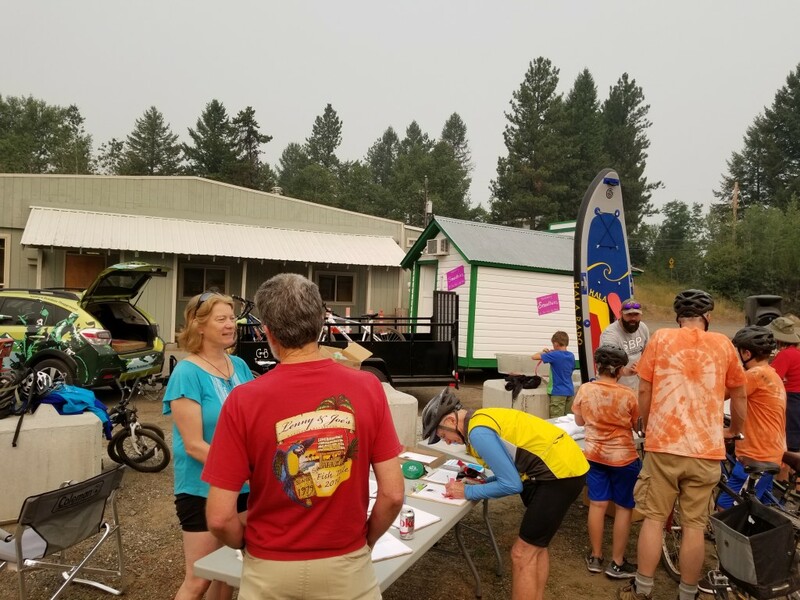 Donnelly is about 13 miles from each of McCall and Cascade, she said, adding that the trail would also be a perfect venue for electric-assist bikes as well. 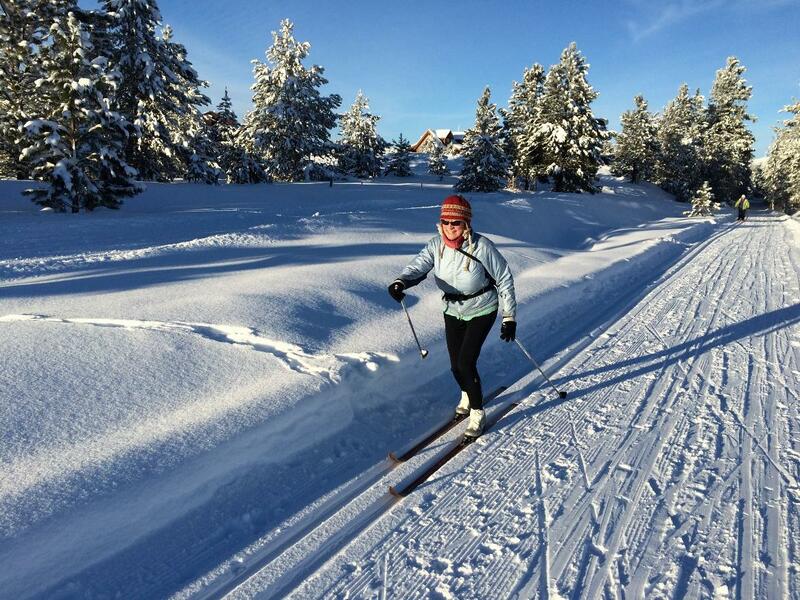 There’s about 5+ miles of xc ski trails to explore south of McCall, starting at the Activity Barn and going out the North Valley Rail-Trail to Heinrich Lane. 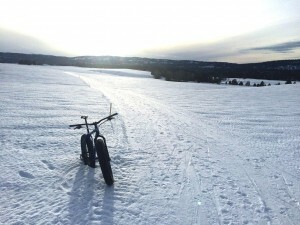 The trails are open to xc skiing, snowshoeing and snow-biking. There is no charge to use the trails. 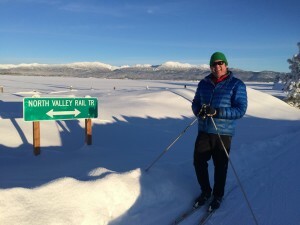 You can ski or ride a big loop in the snow-covered pastures by the Activity Barn, and then do an out-and-back experience on the North Valley Trail. I snow-biked the full length of both trails on Saturday, Dec. 30, and the trails were nice and firm for snow-biking and all of the other activities. I saw people xc skiing, snow-biking, snow-shoeing and boot hiking. Everyone had a smile on their face on a sunny bluebird day with temperatures just below freezing. Pretty much ideal! While you’re out by the Activity Barn, consider adding to the fun quotient by going tubing or sign up for a sleigh ride. McCall, ID 83638. All contributions are tax-deductible. 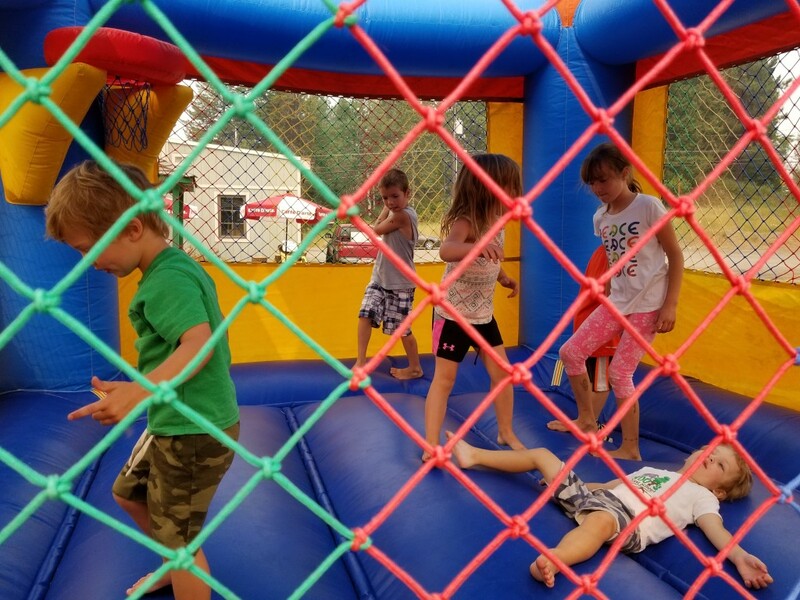 We had a successful event on Saturday, Aug. 5th even though we awoke to dark, smoky skies in McCall. We appreciate everyone who participated, and also everyone who volunteered for the event and our event sponsors and co-sponsors. 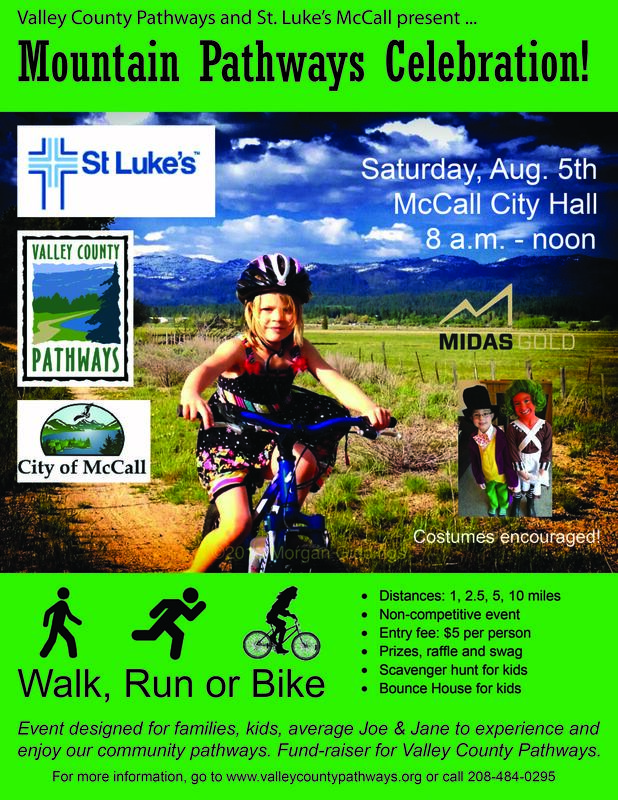 First, a big thank you to St. Lukes-McCall and McCall Parks & Recreation for co-sponsoring the event. Lyle Nelson and Kurt Wolf were instrumental in planning the event, and Erin Roper put a polished touch on our event poster. 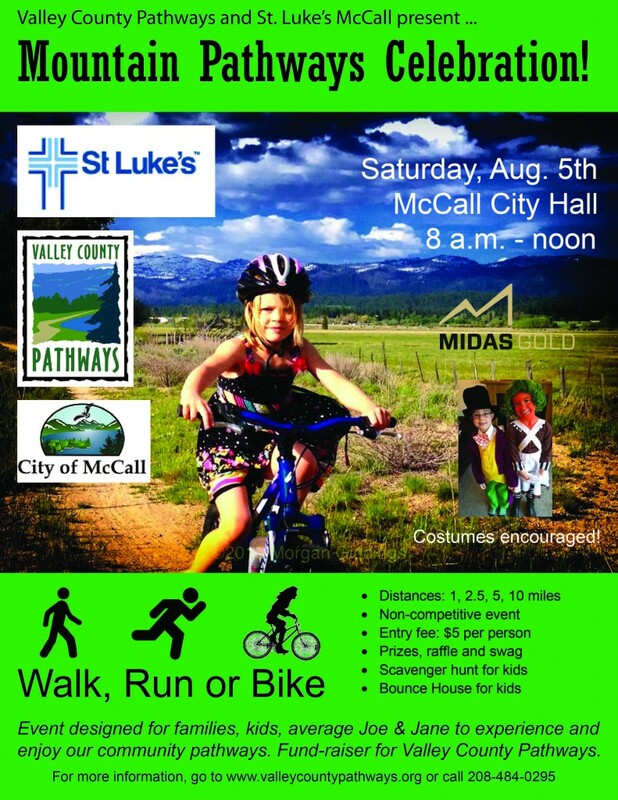 Thanks to Midas Gold for sponsoring the Harlow’s bus shuttle, and to Idaho First Bank for sponsoring the McCall Party Rentals Bounce House. Our bus driver, Christy, donated her time after working the event. She did a great job! We also want to thank Albertson’s in McCall for donating food and water bottles. 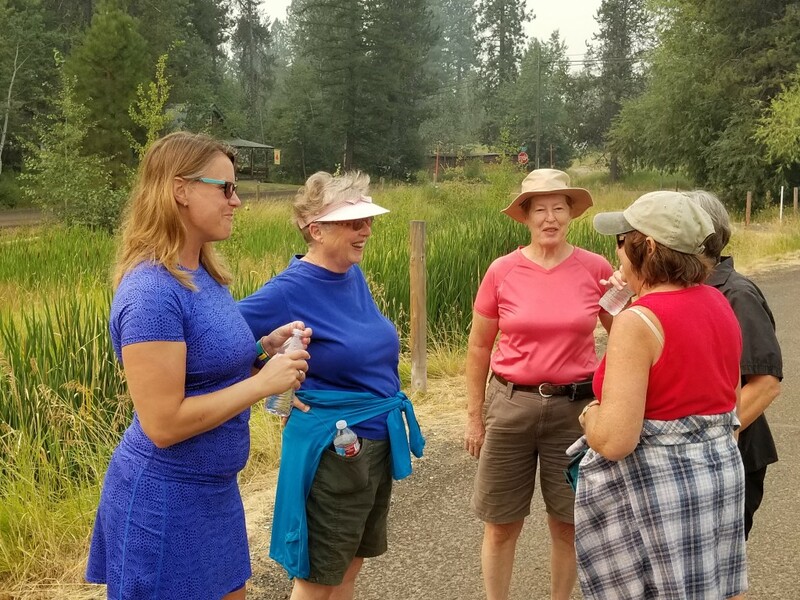 We had awesome volunteers at our aid stations along the 5-mile course on the North Valley Trail and McCall City Pathways. Thank you to our aid station volunteers! At Mile 1, McCall Parks & Recreation. At Mile 2, Melanie Holmes of Remax Realty and Sherry Maupin of Idaho First Bank volunteered at the River Ranch location. Both of these professional women are very busy and stretched to the limit, but they still came out to support pathways. At Mile 3, Michele Crester, manager of the McCall Activity Barn, regaled participants as they passed by the tubing hill, which is a beautiful tall-grass pasture for cattle in the summertime. At Mile 5, Brett Shepherd from Tamarack Resort and Cindy Lee greeted folks as they disembarked the bus shuttle and started their journey into McCall. This was a fund-raising event, and we made most of the funds from quality items donated for our raffle. We also want to thank Hometown Sports for bicycle maintenance support at the event. Volunteers who worked the Start/Finish area included Wendy Wilson, Kurt Wolf, Lyle Nelson, Steve Stuebner, Andrew Mentzer, Genny Mentzerske, and we had a great D.J., Dayna Kunkel, who played upbeat music all morning. It will take a broad-based community-wide effort to build a valley-wide pathways system in Valley County! The same kind of community spirit that prevailed during our event will give us strength to move ahead! We are arranging for bus/shuttle transportation and need to know how many people will need a shuttle. The people who walk, run or bike 5 miles will need a shuttle so they can experience the full breadth of the North Valley Trail and McCall City Pathways.